I’ve been topping dishes with Greek yogurt for a few years now which I was reminded of again today when I opened my freezer in the basement. Blueberries, strawberries, raspberries, preserved tomatoes, fruit compotes, tomato sauce, etc. are all housed in that same yogurt container. 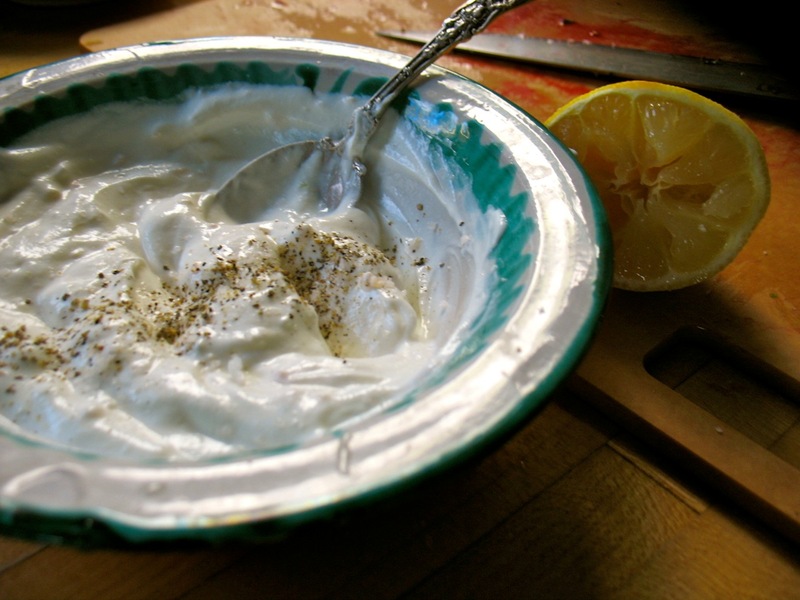 Greek or Greek-style yogurt is regular yogurt that’s been strained which removes some of the liquid whey making it thicker, richer, and creamier. It’s delicious on savory pancakes and fritters, soups and stews, roasted vegetables. . .. you name it! I first started using it instead of sour cream. I used to buy sour cream for some specific recipe and then the rest of it would be forgotten and wind up moldy a few weeks later. I don’t have this problem with Greek yogurt and find plenty of uses for it–sweat (with fruit and honey or jam, . . .) and savory. I use it when sour cream is called for and when nothing of the sort is called for. I’ve started topping Dorie Greenspan’s wonderful French Swiss Chard pancakes called Farçous (which I will blog about soon) with it, mixed with some lemon juice and zest. I dollop it on lentil soup and Indian dhals. Many cuisines around the world use yogurt or some similar fermented dairy product as sauces and toppings for all kinds of dishes. It provides richness and a smooth, cooling counterpoint to vibrant and spicy food. And since it’s fermented with live cultures it is easier to digest, adds good bacteria and aids in digesting other foods. I got hooked on yogurt because it tasted so good but have become even more devoted to it and other cultured/fermented foods as part of my meals since I’ve learned more about it. Cynthia Lair, author of Feeding the Whole Family includes an excellent summary of the benefits of these foods in our diet in this book. This week I made a dish with beets and beet greens a friend of mine taught me which takes advantage of all the characteristics of Greek yogurt (or plain, regular whole-milk yogurt). Cut the greens off the beets, wash well and cut into wide ribbons. You can use most of the stems. I usually just toss the 2-3 inches closest to the beat root. Scrub the beets well and cut into wedges. Put the beets in a small pan and cover with water. 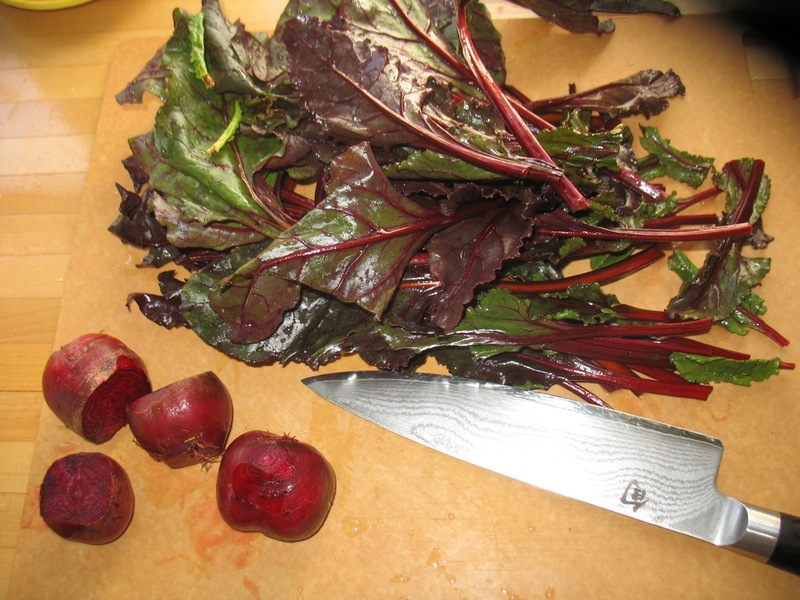 Bring to a boil and cook covered for about 15-20 minutes until beets are tender when pierced with a fork. Drain well and toss with a little lemon juice and salt. Meanwhile saute the onions or shallots in a little olive oil over medium high heat until soft. Add beet greens and a little olive oil if necessary and one clove of garlic, minced, and a few pinches of salt. It will only take about 3 -5 minutes for the greens/stems to be tender. In a small bowl mix the yogurt with the remaining garlic, a pinch or two of salt and the teaspoon of lemon juice. 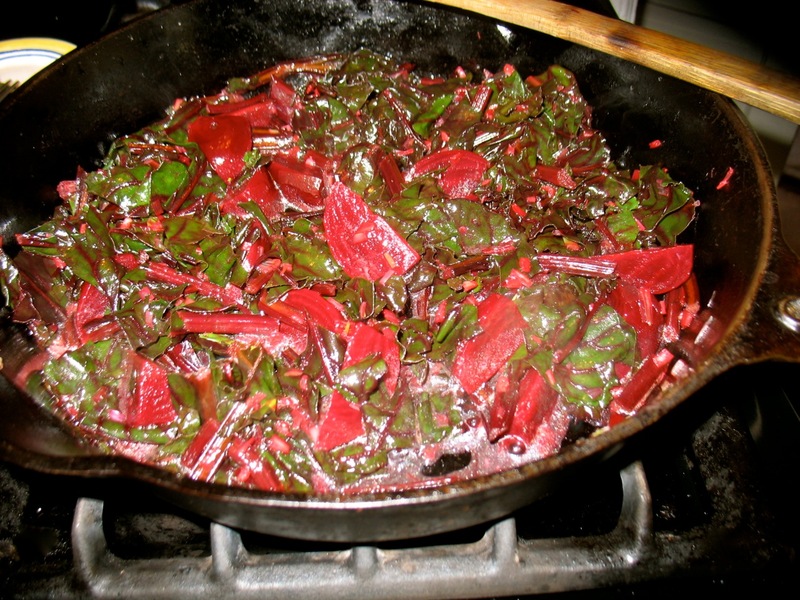 Mix the beet wedges with the greens and heat thoroughly and then serve with a generous dollop of the yogurt. Greens and Beets ready for the Yogurt! A quick note on brands of Greek yogurt available in the Portland area. Oikos, Chobani, and Greek Gods are the ones I’ve seen in the stores I frequent. The problem with Chobani and Oikos for me is that they don’t have full-fat versions. I’m not such a fan of reduced fat milk or dairy products since their nutritional composition has been changed and I love the flavor of the full fat versions and I don’t eat it in large quantities. The Greek Gods one is not organic but it’s Rbgh (bovine growth hormone) free so I tend to buy that. Ideally I’d make Greek yogurt myself by making my own yogurt and then straining it or straining Nancy’s whole milk plain yogurt but until I get in the habit of doing so I’m gong to continue enjoying it from the store. I’d love to hear what kinds you use or if you make it yourself. Oh I’ll have to look for that brand. Thanks for the note. I love greek yogurt, I love that it has so much protein in it, which I struggle to get into my kids as it is – but they love yogurt. I would be totally interested in making my my own yogurt, greek or otherwise (but yes – full fat please). So if you want to experiment, let me know, I wanna come help! Not sure what was going on in my head there but I certainly “beat” it do death! In Greee we ate FAGE yogurt; we can get it where we are; check for it next time — it is AMAZING, especially with honey. I meant ” in Greece”…sorry. I will look for it again. I’ve heard wonderful things about it but haven’t seen it here. Costco carries it but I was a little turned off by the NY association. I don’t like to buy things that travel that far unless it is spices or coffee. It is good though. 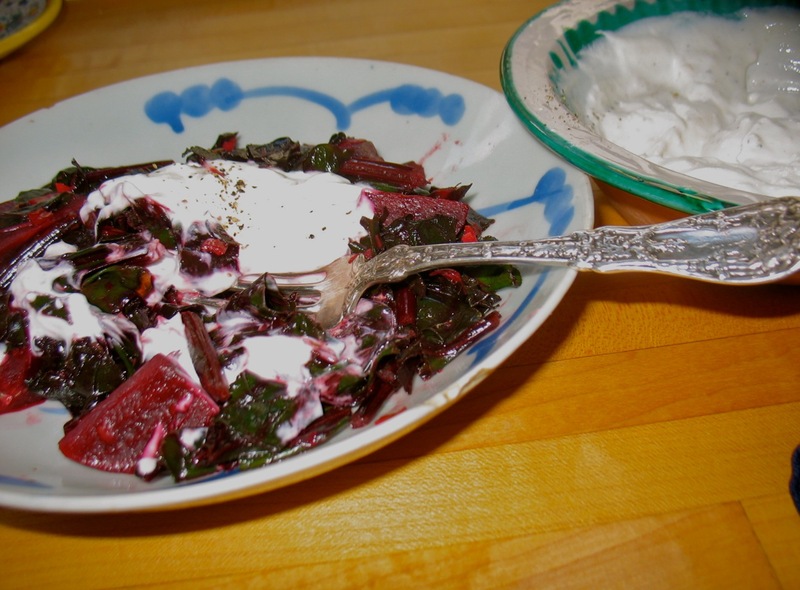 Love, love, love this Beets and Beet Greens with Garlicky Yogurt recipe! So delicious, and so beautiful. I make it with a little more olive oil, garlic, and lemon, (but I’m 1/2 Greek and like those flavors strong). Thanks, Katherine, for another great recipe!